Environment modules allow users to switch between different versions of compilers, libraries, and other installed software on a supercomputer. On the command line, environment modules are typically configured using commands like module load gcc/4.6.2 or module swap PrgEnv/cray PrgEnv/pgi. PTP provides the ability to configure a set of modules to be loaded when a synchronized C/C++ or Fortran project is built. Module commands can be entered manually -- just as you would enter at the command line -- or they can be configured using a graphical interface. A brief description of Environment Management with Modules is available in the Environment Management section of Building Synchronized Projects. This section covers more additional details. Note: The following instructions apply only to synchronized projects. Currently, it is not possible to configure modules for local or remote projects. This brings up the Manage Synchronize Configurations dialog. Alternatively, this is also available from the Project Properties dialog, on the Synchronize page. 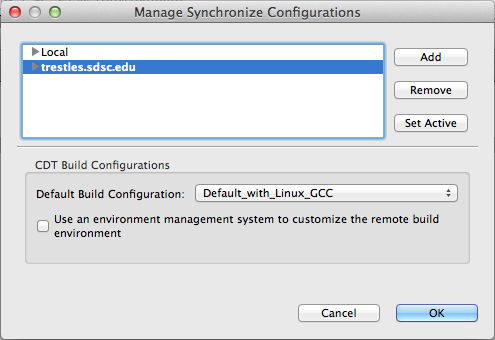 Here we illustrate it from the first alternative, the Manage Synchronize Configurations dialog.